Breaking the paradigm: Should Newcastle go all out for the League Cup? | NUFC Blog. Breaking the paradigm: Should Newcastle go all out for the League Cup? These embarrassing pictures really need to be updated now. Of course, the League Cup is regarded as the lowest rung of the “major” trophies. Conventional wisdom in the highest echelon of English football, ie the Premiership clubs and especially the top Premiership clubs, is that it gives them a chance to give their precocious bairns who aren’t quite “ready” yet a chance for some kind of meaningful competition. It is also a chance to dust down old cloggers kept in case of emergency and give them a chance keep their hands, or more correctly perhaps, their feet in, lest they spend so long on the sidelines that they seize up with arthritis, or forget that they were ever footballers on the first place. There are undoubetedly reasons for this, which is why top managers who have forgotten more about football than I will ever know treat it in exactly this way. It is true for the lower Premiership clubs that survival in the division comes above everything for the financial reasons I’m sure you all know, and the teams at the other end have much bigger fish to fry, ie competing for the greatest prizes of all, the League and the Champion’s League. However, conventional wisdom can sometimes be so prevalent that the most productive thing in the long term can actually be to go against the grain, to break the existing paradigm quite simply because hardly anyone else is doing it. Anyway, we scraped through thanks to the permed one’s heed in the dying seconds and are now into the last sixteen. If we can win just four more games, some of them against teams which will almost certainly continue with the same policy of bairns and shaking the cobwebs off their squad players, we would win our first major trophy in 43 years AND have a guaranteed place in the Europa League. If the club the size of Newcastle United is worried about relegation, that is an indictment of the club in itself. If not, then what are the club hoping for by the sacrifice? At the other extreme, despite our very good start to the Premiership campaign, it is still more doubtful that we would gain entry to Europe by being in the top six at the end of the season and we still wouldn’t get a trophy for that unless we beat the likes of Manchester United, Chelsea, and Manchester City for the very top spot. Are we holding back so that we may finish the season in ninth instead of twelfth or something similar? When Newcastle last won a “major” trophy, the “Inter City Fairs Cup” which subsequently became the “UEFA Cup” and now, the “Europa League”, it was broadcast in black and white and the captain of that squad, the venerable Bobby Moncur, is now a 66 year old pensioner. 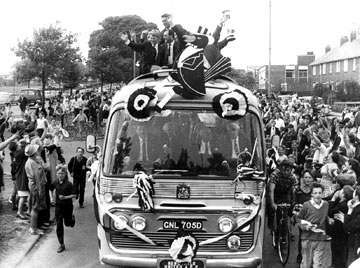 The lack of a proper trophy since now resides in the deepest recesses of most Newcastle United fan’s psyches, especially so when we see clubs such as Portsmouth and Birmingham City holding glorious open top bus parades in glorious digital technicolour. It’s sickening, especially when you consider that even the vagrants of Wearside have won an FA Cup in colour. I even held it (and almost dropped it) that year which makes it even more sickening for me personally. Even looking at it from Mike Ashley’s point of view, in other words to play advocate for the Devil incarnate, winning a trophy at this club really would be the ultimate propaganda coup, which would even keep truculent Geordies like myself quiet (for the moment) about those awful publicity signs the habitual misreprentation of what’s gannin’ on at the club. Perhaps even Ashley himself could take a trip with the lads on an open top bus down the Westgate Road without kevlar body armour and a helmet. Who knows? Let’s face it: this is the only trophy we’re likely to win any time soon. I’d like to see a full-strength side in the next round. Birmingham wasn’t relegated last season because they put good squads in for league cup games. It was their inability to score at all in the second half of the season that doomed them. 9 changes was a lot to make but that shows there is a lot of depth to competition for starting places. depending who we draw in the next round i think AP will play a stronger team in the next round, we will have to beat at least 1 good side to win the trophy and its likely going to be one of the current top 3 sides in the league. I’ve been argueing this for a while now – so I’ll add a few of points. A cup victory will increase our status and bring loads of good publicity. It will make us a better prospect in the transfer market. It will cheer up the whole NE (at least the B&W part) and send home crowds (down slightly) soaring again and increase our income. It will make us a successful team with increased moral. Managers & owners have an eye on league position because thats how the PL pays prize money – I think its about £600,000 per place – so we would be financialy better off concentrating on the league where finishing 3-4 places higher is more rewarding than a full cup run. In our position I think the emotional aspects and spin offs from a cup should outweigh these simple financial calculations. Recently, club comments appear to support the cup first view. Certainly KK said that it was important to us and was our only real chance of success. And I read that when CH was dumped part of the dissilution with him was his negative attitude to the cup. Perhaps in a couple of seasons we will be established as a top 6 club (why not?) in which case I would accept that the cup was a distraction from the real prize. But not yet – at this time it is our only realistic route to success (which most Toon supporters can’t remember) – so go for it! A cup victory! The ground under the city will move! Including a run in the Europa League too supermac? We will also have the temptation of European football to offer to trasfer targets etc etc. £1.8 million is buggerall in football nowadays. Is it in fact somewhat embarrassing to win such a dubious award ? Perhaps we should just give a run out to the wannabees and plodders like everyone else, until a second tier team with ambition kicks our asses out. And oh ! bye the way, you must be one of the few people in this world Workey, who understands the definition and usage of such a BIG word. Who knows you could perhaps with a little effort become the Joey Barton of the blogging world. I agree – sorry if I was unclear but I was suggesting it was a false strategy for a club to make. I forgot to out the new poll in there! “embarrassing” to win a cup & qualify for europe? What planet are you on? But seeing as you mention Barton, for some reason all the hubcaps have reappeared on the players’ porsches since he left. I could teach Joey Barton a thing or two about Friedrich Nietzsche and George Orwell Chuck. gan for a cup, why wouldn’t we? But don’t risk everything for the sake of it. You think we’ll get relegated if we try to win it Clint? all depends on how focussed or obsessed teams/players get mate. Na, i don’t mate, just not that chowed about the cups. Cool as, if we won one, but i’m more concerned with us getting back into the higher eschelons (sp?) of the league. 9 sounds like a lot of changes – but such is the fluid and, in some cases, unknown state of the squad I’m not even sure it was that much weaker. Marveaux and Arfa are 1st team starters in waiting coming back from lay off.. None of our strikers are exactly stand out despite best’s 3 goals- it’s fairly interchangeable up front. Tiote is still sharpening up, raylor playing out of position etc. Rob Elliot, Danny Simpson, Fabricio Coloccini, James Perch, Shane Ferguson, Sylvain Marveaux, Dan Gosling, Danny Guthrie, Mehdi Abeid, Hatem Ben Arfa, Peter Lovenkrands. Just shows that there are two good teams in the NE, NUFC & NUFC Reserves! Hey guys get real. We’ve beaten Scunthorpe and Forest. We have yet to play anyone of significance this season so maybe we should keep the “Cup winning” dream stuff for another day shall we ? Hey guys get real. We’ve beaten S k u n thorpe and Forest. We have yet to play anyone of significance this season so maybe we should keep the “Cup winning” dream stuff for another day ? I’m of two minds. Would love to have an extended cup run… worried about injuries up front or in the back. Would be an excellent opportunity to keep working on the fringe players. It seems like Marveaux’s made a very strong case for a spot in the starting 11. We’ll probably draw ManU away in the next round. Hopefully we’ll face easier opposition and there will be a large number of prem teams going head to head. We’ll see I suppose. Doesn’t really matter what we want in the end. Slightly off topic (in fact way off topic) but on the same “Earnings” League tables this is how much CL football means to the top four nowadays. Dont forget this was the season before last ! I really hate that f*@%ing place now Andy! Andy, more within Newcastle’s realistic ambitions, Fulham made over €10 million through reaching the final of the Europa League the other year which was actually more than the winners who beat them in the final, Athletico Madrid. Obviously that’s very small potatoes in comparison to the likes of Barcelona and Manchester United in the Champion’s League, but it’s still better than a poke in the eye, or even two Cabayes, and it’s Fulham. Why are you such a negative git !. Surely, when there is so much posativity around the club, (fat ash aside) is it not more beneficial to want to win something that would help take the monkey off our back. It is people like you who have devalued the League Cup with your diminutive attitude and if we are to improve as a club, we should go for the posative. HTL. We’re not in Europe this season so why not ? First my apologies for devaluing the league cup, with my diminutive attitude, i will attempt to be less diminutive in future, ok ? Prefer the quotes of Oscar Wilde, like ! Have a sneaky suspicion perhaps Joey had a book of famous quotes, seemed to have one for every occasion, then again suppose he had plenty of time to read in jail or on the bus. Very droll !. Get yr point but we have this potless situation hanging over us and I for one am just a little fed-up now of having to put up with the taunts of delusion etc etc, . I managed to miss the last cup win as I wasn’t born till 49 but iv’e seriously tried to make up for it since. All to no avail. I even managed to miss the fairs Cup win after following the lads all over Europe, I was sitting my City and Guilds @ S.Sheilds Marine Tech on the night of the final. I’m 62 next month and would love to see at least one open top parade through the toon, even if I have to swim from Cyprus. Never mind, It’s all in the life of a deluded ex-pat. We have a great supporters club her and the game is on every week so I can’t complain.Probably see more games than most. Good luck for Saturday lads, I’ll say 3-1. HWTL. No need for appologies mate, this is all about opinions. Sorry if i gave any offence.